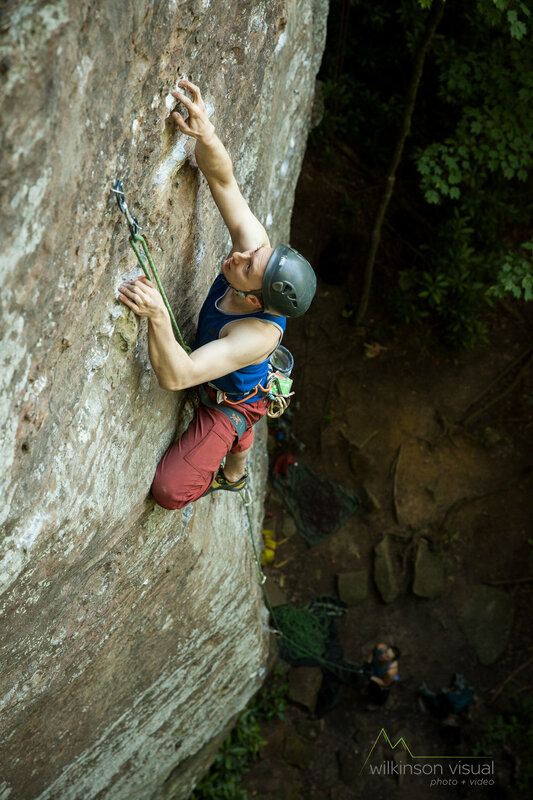 Over the last five months or so, I have enjoyed many days in Red River Gorge, spending hours on Kentucky's finest sandstone routes. While spending time at the crag with friends is always a good time, I definitely had some photography objectives in mind as well– including collecting images for a new guidebook. There have been several editions of the South Guidebook for the RRG, and I knew that a new one was in the works. A lot of new routes have been established, and featuring classic climbs, both new and old, would be desirable for the next book. I coordinated with the publishers and one of the editors of this guidebook to identify areas that were in need of some photos. Once I had the list, I started emailing and making calls, lining up as many crushers as I could. That's one thing about the tribe I've learned in five short years of climbing in the Red; people are happy to help out, especially if it involves climbing. 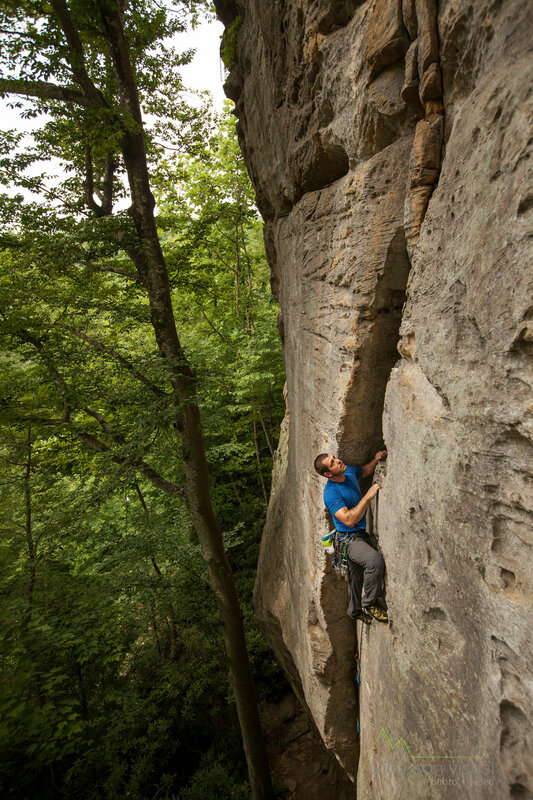 Since the guidebook would be for the South, all North end crags were off the table. The first real shoot I put together included tradster Heath Rowland and our friend Adam Brusven. We made the most of this opportunity and decided to check out Muir Valley, where we captured some great shots during a sweaty summers day. A week later my friend from Michigan made the trip down to Kentucky for a few days. I spent most of my time actually climbing, but was able to shoot from a rope on one day and ended up with a few decent images of him on Aural Pleasure in the PMRP. Another week or two later I met up Ian Hahn, who had been traveling around climbing the last year, going from Smith Rock to the Red. He's an old friend from Northern Michigan, where we spent a week working on the National Parks Adventure project. 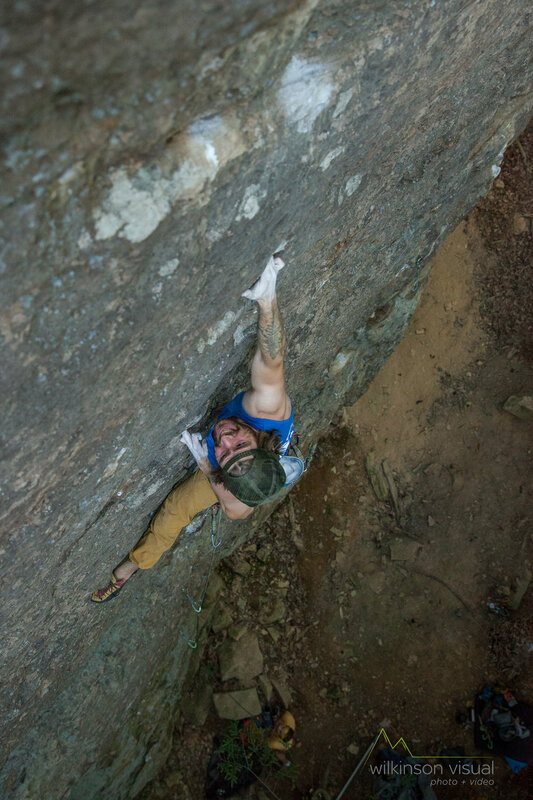 Ian joined Jimmy Hoctor, Blake Bowling, and Stacy Hodges, who were all up for throwing down on some new climbs at the Velo Crag and Shipyard. As fall drew nearer, I used my best six-degrees-of-Kevin-Bacon-skills to find some fresh faces. I was eventually able to organize a shoot day with crushers Rachel Avallone and Karsten Delap, who put in strong showings on some of the new classics at the Bear's Den area. My buddy and Blue Stallion "Athlete" Matt Hodges joined the party as well, and we captured a lot of solid images that day. The new guidebook should be coming out around April 2017, and is going to be filled with all sorts of amazing images and new route listings. I can't wait to see it! Big thanks to everyone who came out and worked with me this past year!